Mrs. Snyder’s second graders at Central Manor have been skyping with Miss Nithya, a journalist from Chennai, India. The students have learned about the customs, foods and daily lives of the people of India during their skype sessions. 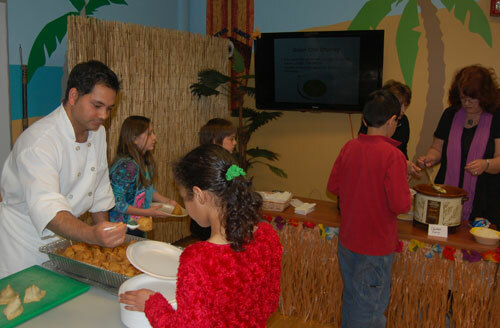 The class had a food fair so they could taste some of the traditional foods. The chef from the Taj Mahal restaurant talked with the students about spices that are used and did a demonstration on how to prepare somosa, a popular appetizer. The students enjoyed sampling the different Indian foods. The class will be skyping with Miss Nithya at the end of May and sharing their experiences and opinions on Indian food with her.